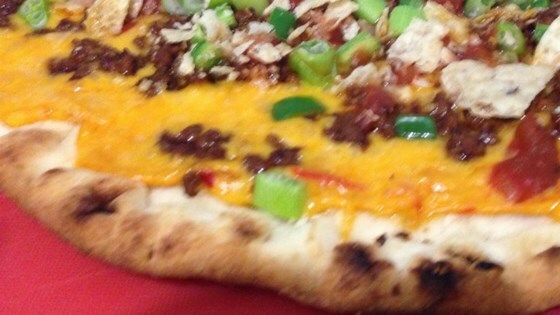 "It is exactly what it sounds like - all the toppings you'd get on a plate of nachos on a thin pizza crust! Add your own favorites to customize the recipe, like guacamole, refried beans, etc." Cook beef in a large skillet under no longer pink, about 5 minutes. Drain. Stir in seasoning mix until evenly combined. Place pizza crust on a work surface. Spread queso dip evenly over the crust. Top with Cheddar cheese, cooked beef mixture, jalapeno, and green onions. Spoon salsa onto the pizza in random spots, making sure it's not mixed in with the other toppings. Sprinkle crushed tortilla chips on top. Bake in the preheated oven directly on the middle oven rack until cheese is hot and melted, about 8 minutes. Serve with sour cream.